Blog | Is High Specification Technology Possible In A Low Cost World? Possible In A Low Cost World? We read all the time in the O&G journals about the industry’s new-found ability to operate in a low cost, $50/bbl world. But has safety been compromised? Have technical standards been watered down? Have operators given service companies and equipment suppliers reduced specifications to meet this pricing challenge? No, of course not. Without these fundamental building blocks, our industry would not be where it is today. So how have we addressed this issue and what can we offer customers to meet these dual requirements? I have two examples that I would like to share with you. For many years, we have sold wellhead outlets (WHO) for offshore platforms, developing solutions for many specifications, underpinned by API 6A. The principles of anti-corrosion, design integrity, rigorous testing and quality assurance are where we excel. To maintain these high standards, but use them to develop new, more cost-effective products, has meant questioning our in-house design criteria on some of the requirements we receive for quote and tender requests. Many of our WHO design principles are based on the upper pressure and temperature thresholds. 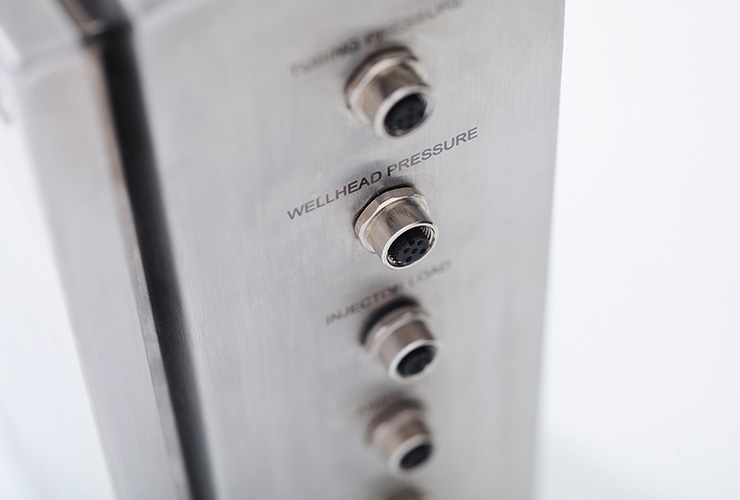 Since 2013, we have sold our cost-effective Type CA electrical wellhead outlet which has a glass to metal feedthrough arrangement suitable for a maximum operating temperature of 160°C. However, many applications require a lower temperature ceiling than this. Elastomers are suitable at these lower temperatures and cheaper so the product range has recently been extended to include a Type CB WHO which has an elastomeric feedthrough arrangement. This takes the maximum operating temperature down to 100°C and so opens up the opportunity to supply an integrated WHO that connects downhole control line to the surface cable, with full explosive atmosphere certification, which costs 33% less than our top end Type C.
We have taken this approach further and asked ourselves and our customers whether there are wells that are low pressure and low cost, where a wellhead outlet without a cablehead could be used? With the Type CC WHO we have done this and can again provide an integrated unit, designed and built with API 6A principles but for 60% less than our top end Type C. Good value when you get rid of junction boxes, stuffing boxes and crazy pipework! To support our Directional Coiled Tubing Drilling service, we have developed our own data acquisition system to support the downhole environment as well as the data integration with operators and partners. However, the software allows us to provide separate stripped-down modules for individual applications such as well integrity monitoring which only requires a pressure and temperature sensor and maybe a pump rate. Much narrower specifications strips out the need for the full system and consequently saving costs for you as the customer. This approach has led to the development of our ACQUEST product line which is a fully bespoke data system, modifiable to the customers’ needs, including explosive atmosphere certified wireless options. Importantly it allows the options to be modified around the price the customer wants to pay. At the most cost-effective end of the spectrum, our hard wired DAQ-H option is a power and connections unit, a junction box suitable for up to 10 sensors (digital and analogue) and a standard tablet to run the software. The unit is easily upgraded to zoned options. These two examples demonstrate how we have approached this challenge for our existing and new product lines. By looking at the specifications of our products against the customer requirements, we have identified where we can compromise to provide a more cost-effective solution. We will continue to employ this approach, as will many companies in the oil and gas market who are also facing the same challenge.